Before the summer passes by so fast with so much to do, please mark your calendars for Casino on Cardboard at Coronado Beach on Saturday, August 10th from 5-8pm. This is one of our favorite spots in San Diego. This is the Augusts installment of Casino on Cardboard and we are taking it back to Coronado Beach to watch the sun go down, dance and be among our dancing familia. So come by and dance and share good times in one of the most beautiful beach sites in San Diego. Here is what I need, someone to help me unload the floor and tape it up at 4pm. I'll meet you at Sunset Park in Coronado Beach (same place we had it before). We also need a portable table for food and drinks and a cooler with ice and a couple of trashbags. Come by and bring some snack or drinks, beach towels or beach chairs, a sweater or sweatshirt as it will get cold later as the sun goes down. I'll be leading a few suelta lines and some ruedas ( will have some new moves to share from the Las Vegas Rueda Festival. Pura vida! If you get lost, call me on my cell at 206-300-4523. I will be using my cell phone for the music so after 5:00pm, I will put my cell phone on airplane mode so as not to cut off the music. Please plan accordingly and make you phone calls before. 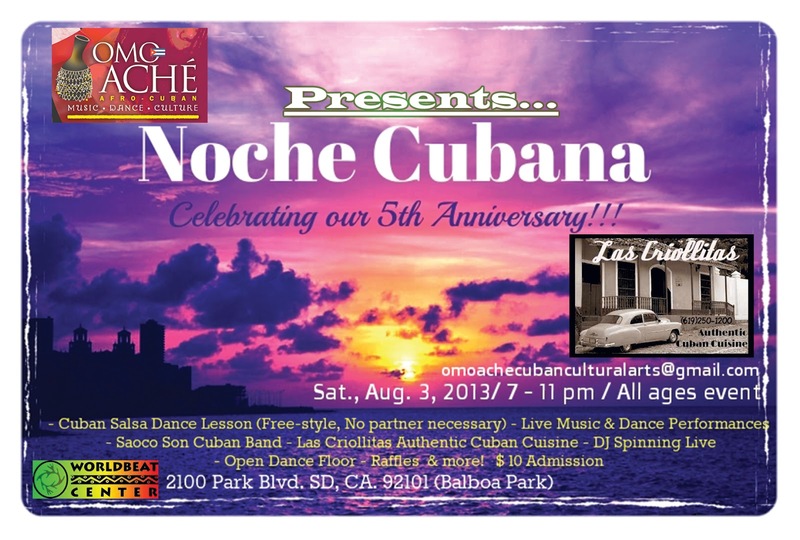 Don't miss the 5th anniversary of this Cuban Music & Dance Party with LIVE performances by Omo Aché Dance Co. & Rumba Ensemble, plus San Diego's hottest Cuban band, Saoco Son, playing your favorite Son & Timba classics and originals for your dancing pleasure! Also featuring FREE Casino (Cuban Salsa) Dance lesson (no partner necessary) taught by Omo Aché Master Dancer, & DJ Pirito spinning the jams for an open dance floor, Raffles & more! Enjoy Las Criollitas delicious, authentic Cuban cuisine & tasty mojitos available for purchase. All ages event. Come dance at the beach....AGAIN!! This is the July installment of Casino on Cardboard and we are taking it back to La Jolla Shores Beach. Sorry everyone for the sudden location change, but we are combining forces with a birthday bash for Christina Picardi, one of our devoted casineras and supporter of many of our Cuban events. We will celebrate wit her as she has reserved a bonfire pit on La jolla Shores Beach. We will go to Coronado Beach in August. LA JOLLA SHORES IS ON! 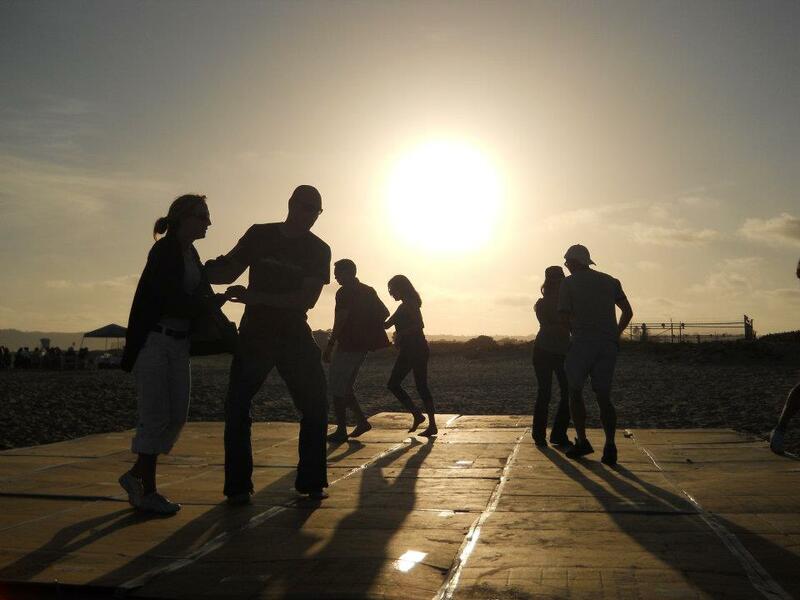 Come watch the sun go down, dance and be among our dancing familia, share good times in one of the most beautiful beach sites in San Diego. Cost: Maritza is kindly asking for a donation as she pays the rent for a storage unit to store the cardboard, and other equipment, the fancy Casino on Cardboard signage and also to help with the future purchase of a snap-together dance floor for future dance parties at the beach. Two people to help me unload the floor and tape it up at 4:30pm. I'll meet you at the La Jolla Shores Park Parking Lot. We also need a cooler with ice and water and a couple of trash bags. This is a snack-luck so bring snack or drinks to share, beach towels or beach chairs, a sweater or sweatshirt as it will get cold later as the sun goes down. I'll be leading a few suelta lines and teaching people who want to learn some of our Carlsbad moves. We will go over caracol, dame con guaperia, adios con son, enchufla pero no, dos con una, setenta corona. If you get lost, call me on my cell at 206-300-4523, my cell will be on airplane mode after 5:30pm, I will not be able to answer the cell as my cell has the playlist for that night. And I am working on a new playlist. If you have any favorite timba songs you want to hear, let me know now until Friday (July 12th) by e-mailing me at sbdiva32@yahoo.com. In L.A. CURUYE's JULY CUBAN SALSA TIMBA DANCE PARTY THIS SUNDAY ! CURUYE's CUBAN SALSA TIMBA DANCE PARTY! COME OUT & EXPRESS YOURSELF! DJ SAOCO SPINNING THE BEST of CUBAN SALSA-TIMBA–REGGAETÓN to keep us grooving all night! Come early at 5 PM to practice Rueda de Casino and to share some moves and calls. KATI HERNÁNDEZ is back in town, and at 5:30 PM she wants to keep us current with carnival in Santiago de Cuba celebrated this month, by giving a short class on CUBAN CARNIVAL DANCES and moves that we can incorporate into our casino dancing. Let's dance some ruedas, cubatón, line dances, casino (Cuban salsa) … whatever moves you, on the third floor of The Granada where we have food and bar service just for us! ALL AGES WELCOME! $10 includes party and dance class! The GRANADA 3rd floor, 17 South First St., Alhambra 91801. Free parking in the structure across the street. SPREAD THE WORD! & LET's DANCE!!! This is the July installment of Casino on Cardboard and we are taking it back to La Jolla Shores Beach. Sorry everyone for the sudden change, but we are combining forces with a birthday bash for Christina Picardi (one of our devoted casineras and supporter of many of our Cuban events. We will celebrate wit her as she has reserved a bonfire pit on La jolla Shores Beach. We will go to Coronado Beach in August. LA JOLLA SHORES IS ON! Come watch the sun go down, dance and be amongst our dancing familia, share good times in one of the most beautiful beach sites in San Diego. 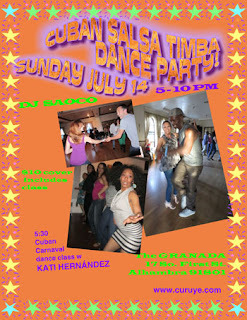 SATURDAY, JULY 6, 3-6 PM: RINCÓN RUMBERO, L.A.’s COMMUNITY RUMBA @ KAOS NETWORK! SPECIAL GUEST MIGUEL BERNAL. FREE EVENT, for all lovers of authentic rumba, and an opportunity for serious Los Angeles drummers, dancers, and singers to put their skills on display. This is a Community Potluck. Instruments provided, but bring some food to share! Donations welcome to help support KAOS NETWORK! For more information call 310-941-3838 or visit L.A. Rumbero (www.larumbero.com). KAOS NETWORK, 4343 Leimert Blvd. (corner w/ 43rd Place), L.A. 90008. SUNDAY, JULY 7, BERNAL will be accompanying KATI HERNÁNDEZ's AFRO CUBAN DANCE CLASS along with Master LÁZARO GALARRAGA 11 AM-12:30 PM. Following BERNAL will teach CHEKERE 12:45-2 PM. $20/class; $35 for both classes. Universal Dance Design, 6009 West Olympic Blvd., LA 90036. TUESDAY, JULY 9, 8-10 PM: BERNAL will be accompanying KATI HERNÁNDEZ's AFRO CUBAN RUMBA DANCE CLASSES: 8-9 LEVEL 1; 9-10 PM LEVEL II. Universal Dance Design, 6009 West Olympic Blvd., LA 90036. 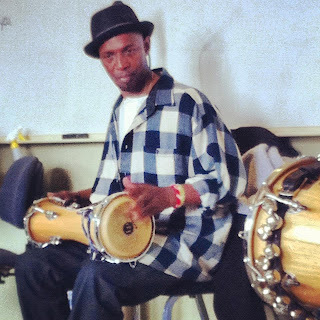 WEDNESDAY, JULY 10, 7-8:30 PM: BERNAL teaches AFRO CUBAN PERCUSSION with GUERRILLA RUMBA.$20 class. 601 S. Clarence St., LA 90023. BERNAL is also available for private classes: Contact 323 377.8184.